There have been a whole lot of Christmas Carol adaptations over the years. I’ve seen a lot of them and likely have yet to see several others. I can definitely say that this is the most memorable one of the bunch and probably handles Scrooge the best. I feel like he put up more resistance than his other incarnations and knowing about the iconic story does put this Scrooge at an advantage as well. The film naturally starts off by showing how mean Scrooge is. He is corporate to the core and won’t even let his people have Christmas off. That’s because he wants to have a live show on Christmas for the extra ratings. His boss is definitely excited about this and is low-key the real boss of the company. He insists that animals should be added to the broadcast since they watch TV now. Scrooge sarcastically agrees. Unfortunately, his life begins to turn upside down when he is visited by a ghost. He will have to survive 3 more encounters with his personality intact or he will lose to the very story that he has made it his mission to mock! Meanwhile, there’s a new director in town who is called to help with the movie but he may just be there in order to replace Scrooge once and for all. The first act of the film is definitely the best part. There are two kinds of mean leads. The ones who are subtly glorified by the end and make it personal and the ones who are just generally mean to everyone but it’s not all that malicious. The latter is the right kind of mean lead and fortunately that is the one we get here. This is a comedy film that is actually funny which seems to be a rare feat at times. Pretty much any scene with the old Scrooge is solid. He’s very confident in himself and has made it pretty high up in his career by stepping on all those who would oppose him. That’s why he isn’t too worried when the ghosts come knocking. While you can’t help but applaud his proactive approach to finding the ghosts, it does start to hurt his reputation since nobody else can see them and that makes it easy to frame Scrooge. One of the ghosts in particular is quite aggressive as she spends a lot of her screentime beating Scrooge up. This is around where he lost a lot of his fiery spirit and it’s easy to see why. He was effectively humbled here. The final ghost of Christmas Future is also intense as expected. He has always had a really cool design and the movie goes all the way here. The spirit looks rather disturbing and even houses demons inside of the cloak. Scrooge definitely didn’t have a chance against this one. Naturally, it’s inevitable that Scrooge has to turn good since that is the whole moral of the film. Fortunately the scenes of him being good only last for a few minutes but his speech on the TV did drag on quite a bit. That’s probably the only scene that I thought went on for too long but it’s probably because the scene in question was definitely on the cheesy side. There’s two ways you can take his 180 character switch. One is that he has genuinely changed and I’m pretty sure that this is what the film is telling us. The other one is that he is simply playing along in order to keep his life. The spirits basically told Scrooge that they’ll murder him if he doesn’t have a change of heart and while they may have just been trying to scare him, it’s hard to take that risk. He could just be trying to save his own life which is certainly in line with his usual motivation of looking out for himself. The story is also a little tragic since Scrooge initially started out as an earnest worker. When everyone else were having a party he kept on working. He had no time to fool around with the others and just wanted to climb the corporate ladder. As with many though, he eventually forgot why he climbed it in the first place and now takes delight in making everyone else’s life harder. The film does go a little far with some of the costumes though. Scrooge wants to make an edgy Christmas Carol filled with scantily clad characters which is a bit much and the same goes for the female ghost. It’s certainly not a huge deal in the film but since the ghost at least gets a lot of screentime they probably could have given her a nicer design. As long as they keep in the punches (Yes, she goes for full punches and even some combos against Scrooge) she would still appear to be rather scary. One of the main reasons why this film was able to succeed is because the writing was pretty solid. You need a good script in order to make Scrooge witty and mean without going too far. Then the rest of the characters are written pretty well too. I guess the only subplot that feels rather tacked on is the romance with the main heroine. I’m guessing the film wanted this plot because in most of the Christmas Carols, Scrooge’s biggest regret is not getting together with someone. The heroine just never gets much of a role though and seems to have done a very good job of leading her own life without Scrooge. I think just showing Scrooge a glimpse at how happy she is would have sufficed for that plot. It’s one opportunity that he completely lost and he won’t get another shot, but at least he would learn from it. The film doesn’t give it a really big focus anyway so it’s rather minor when you think about it. One subplot that was excellent was Scrooge firing someone on Christmas Eve. That’s definitely one of those things that you just don’t do. It’s an unspoken rule that you wait until after Christmas to let someone go like that. Well, the guy didn’t go down quietly and does take out his shotgun. A very wise move if you’re going to go up against the full power of corporate. The film can really start to get outlandish at times, but never gets too excessive and again, the humor is on point. The film actually manages to pull this off and that’s no easy feat. 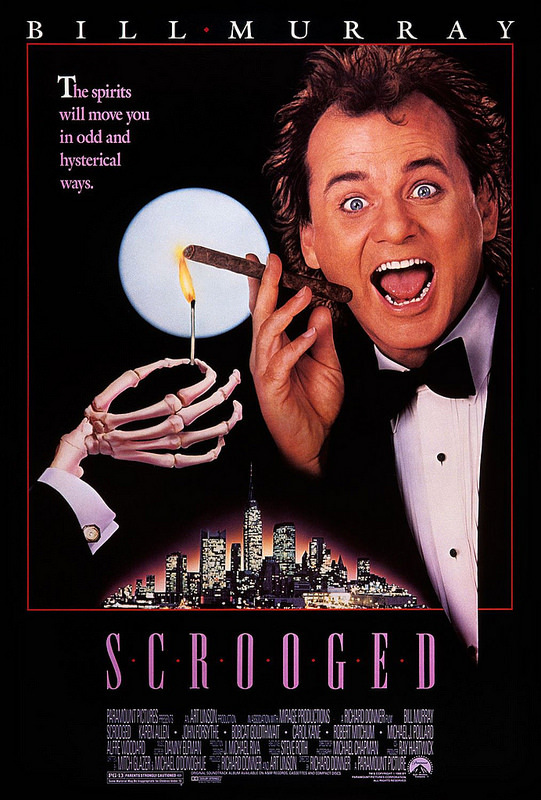 Overall, I definitely enjoyed Scrooged quite a bit. Your enjoyment of it will depend on how much you like Scrooge himself. If you find him to be too mean to the point where you can’t stand to see him on screen then this will definitely be tough. If you don’t mind him all that much then it’ll work out pretty well. The film does a good job of being humorous and has solid writing as well. What more could you ask for? Scrooge maybe cried a little too easily the first time but beyond that his character is consistent the whole time he is the antagonist. The ending of the film is a little weak, but it’s hard to avoid that ending without changing the whole meaning of the story. Scrooge is one of those villains that is actually fun to root for and is more likable than the rest of the cast despite being such a mean guy. That’s how much charisma he has. This entry was posted in Live Action Movie Reviews, Live Action Movies, Reviews and tagged Bill Murray, Christmas, Christmas Carol, Comedy, Film Review, Movie Review, Review, Scrooged, Thriller by dreager1. Bookmark the permalink.